Bollywood beauty Priyanka Chopra and Hollywood pop singer Nick Jonas officially got married in Christian as well as in Hindu traditions. 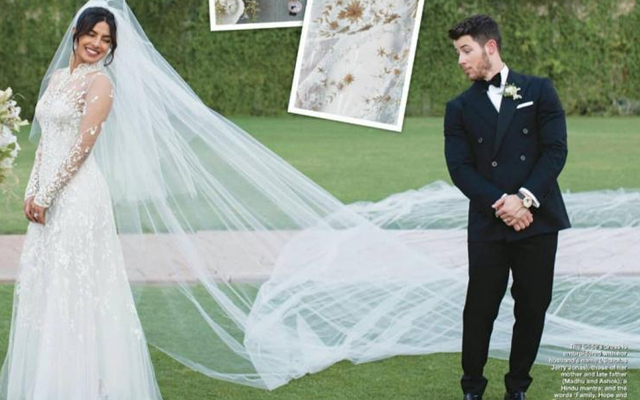 The fans are still going gaga over the beautiful wedding pictures of PeeCee and Nick. It is evident that the wedding took place as the costliest affair. 'Hello' magazine has been releasing the wedding pics of NickYanka one by one and every pic is trending on the internet. The latest pic that got released is now grabbing the attention. It is from their grand wedding in Christian style. The duo have happily and sincerely took the wedding vows and they looked like a perfect match made in heaven. The Desi Girl sizzled in a Ralph Lauren gown and is looking nothing less than an angel. Interestingly, the wedding dress is of 75 feet. The pic features Priyanka looking gorgeous with her million dollar smile whereas Nick is giving a funny expression looking at her dress. The pic is now winning the hearts of netizens. Also, the Hindu style wedding took place grandly and both the families are happy to see the couple.